Foxes have been officially declared a pest in New South Wales but there is concern people are taking them as pets. 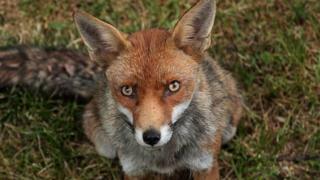 The NSW government has for the first time announced a pest control order for foxes, which are not native to Australia. The order will make it easier for local land services to target foxes and to control who keeps them in captivity. Foxes are estimated to be responsible for about A$227.5m (£121m) of damage to Australia's environment and economy. "The introduction of the pest control order brings NSW into line with all other states in Australia in ensuring that foxes must be controlled by landholders on their properties," said NSW Minister for Primary Industries Katrina Hodgkinson. "Foxes are not companion animals - this pest control order sends the clear message that they are pests, not pets," she said. "Foxes cause extensive damage for livestock producers, with studies showing lamb losses to fox predation can be as high as 30%." People who currently keep foxes in captivity will have to apply for a permit. Sydney Fox Rescue, a registered charity that rescues and finds carers for injured or orphaned foxes, said it was concerned about the lack of provision for ongoing permits. "We understand that we are just one fox control method amongst many, however forcing the closure of our rescue means removing the only no-kill option for foxes currently available in NSW," said the group's president, Charlie Jackson-Martin. He said that would lead people to keep foxes illegally, result in poorer animal welfare and, ultimately, fewer foxes being removed from the wild. He said all foxes re-homed by the shelter were neutered. "Reducing wild fox numbers is our overall goal. It is our understanding that there are around 120,000 foxes in Sydney." But Wildlife Information Rescue and Education Service (Wires) chairman Bill Thompson welcomed the government's decision. Mr Thompson said foxes were having a devastating effect on a wide range of native animals. He said they killed birds, small mammals and reptiles and could infect wombat burrows with parasitic mites that carry the skin disease mange. "It is just a horrible death," he said. "By the time we see wombats that have caught mange they are in such a state they have to be euthanised." Mr Thompson said he understood why some people saw foxes as attractive animals "but that does not make them good for the Australian environment".